Music Together® is an internationally recognized early childhood music and movement program for babies, toddlers, preschoolers, and the adults who love them. First offered to the public in 1987, it pioneered the concept of a research-based, developmentally appropriate early childhood music curriculum that strongly emphasizes and facilitates the involvement of the grown ups who love them. Wiggling, singing, and laughing with your child is so much fun—it’s easy to forget how much learning is taking place in our classes! All of this happens regardless of the ages in our mixed age classes, as children learn from music making with the grownups in the room and other children in the mixed age setting -- They all learn at their own pace with developmentally appropriate music & movement being introduced. Did you know that making music and movement at the same time engages every PART of your brain? This is the only activity that engages every single part of your brain, which is one of the reasons why we always feel so good when we sing, dance and play with instruments in our classes! All of these amazing benefits of taking music at a young age on a consistent basis are incredible. Not to mention the fun we have in class that lasts throughout the week with music making continuing at home, with your family. It also helps your child get ready for a preschool setting & formalized instrument lessons later. Best of all, it builds a wonderful passion for music that lasts a lifetime. Music Together® classes are based on the recognition that all children are musical. All children can learn to sing in tune, keep a beat, and participate with confidence in the music of our culture, provided that their early environment supports such learning. For hundreds of thousands of families worldwide, Music Together® is all about children and their grownups joyfully sharing songs, rhymes, movement, and instrument play, both in music class and in their daily lives. The cornerstone of the Music Together® program is the Mixed-Age music class, for children from birth through age 5—and the grownups who love them! Gathering babies, toddlers, and preschoolers together makes each class fun for all. 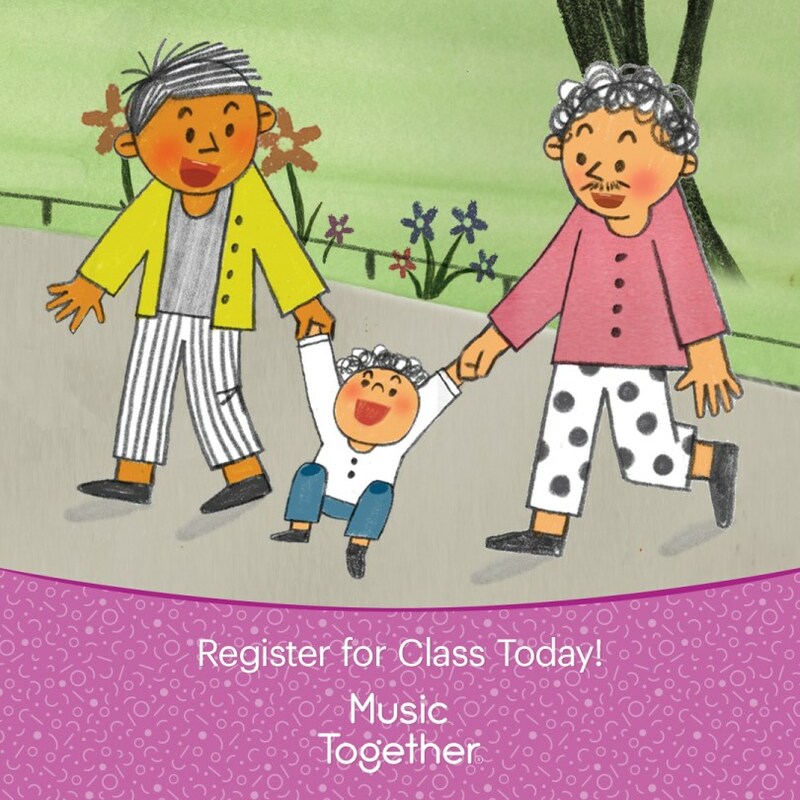 There are lots of group activities for kids out there, but Music Together® offers a true family music class for the youngest infant to the oldest great-grandparent, and everyone in between. Imagine an extended family with a dozen or more kids and a bunch of caring adults, and you'll get the idea! Each semester, families receive a new CD from the Music Together® collection and a beautifully illustrated songbook filled with music-making ideas for spontaneous music play beyond the weekly classes. Also included are other print and online resources to help continue the music-making fun at home and nurture your child's musical growth—even if you don't think of yourself as a great singer or dancer.